Gerry was released from prison on 19th October 1989 after serving 15 years as an innocent man. In November 1974, the then 20-year-old was arrested in Belfast for his supposed part in the IRA pub bombings in Guildford, which killed five people and injured 65. Conlon had never been to Guildford. But along with three others – who became known as the Guildford Four – he was sentenced to life in prison on the basis of confessions obtained under torture by Surrey police. 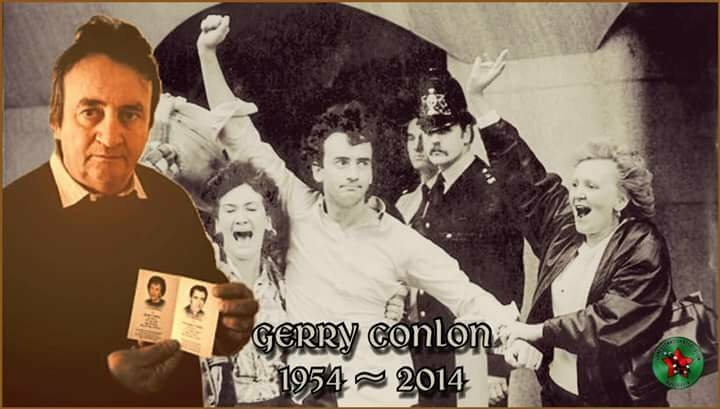 Conlon’s father, Giuseppe was also arrested and charged in connection with the bombings after he travelled to England to organise legal representation for his son. Giuseppe Conlon, along with Conlon’s aunt, Annie Maguire, her husband Paddy and their family – who became known as the Maguire Seven – were convicted on the basis of dubious forensic evidence which the prosecution claimed proved they had handled explosives used in the bombings. Giuseppe Conlon was sentenced to 12 years’ imprisonment and died in prison less than five years into his sentence. The forensic evidence used to secure his conviction was later exposed as fraudulent. The Guildford Four and the Maguire Seven, together with the Birmingham Six, continue to be viewed as three of the most deplorable miscarriages of justice in British history. With many thanks to: James Connolly for the origional posting.